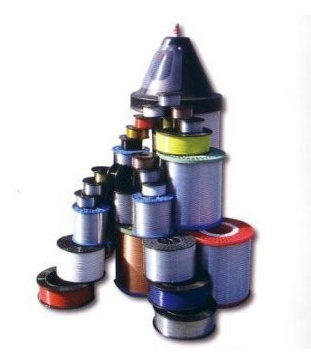 For over 30 years Fine Wire have supplied the printing and packaging Industries with stitching wire. Our commitment to quality products, competitively priced, has led to regular repeat business from customers all over the world. Previously known as Prime Wire, we were the first to introduce the MP100 spool and Easydrum into U K printers. Wire manufactures worldwide now accept that this is the industry standard. 300 kilo Easydrum pack of wire to increase productivity. Galvanised wire with enhanced metallurgical properties for high-speed presses. "Powerbind" wire having a higher tensile strength whilst retaining very good ductility. A tin coated wire to improve machine part wearability. We offer the most comprehensive range of products and presentations available. Our service is backed with technical assistance to suit the ever changing demands of our customers. In house design,development, and manufacture of equipment to handle and dewind wire in the most effective way are all part of our service. All our products are manufactured to ISO9001:2015 standards from selected grades of alloy steel with enhanced metallurgical properties.